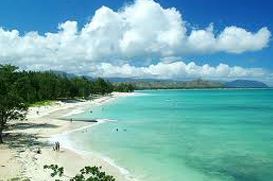 Real estate in Kailua offers ample opportunities for both buying and renting. Many neighborhoods offer a plethora of single-family homes, as well as condominiums and townhomes. Known predominately as a beach community, most residential areas are no more than a few miles from the beach. Architecture tends to be modest post-war post and pier bunglalows, or mid-century bungalows, plantation or ranch-style homes, mainly built between 1945 and 1965. For more modern construction, luxury homes and estates can be found in other areas of Kailua, such as in Lanikai and Beachside. Thanks to its beautiful commute to Honolulu, gorgeous beaches, and proximity to Marine Crops Base Hawaii, the property values in Kailua have held up much better than most other areas on Oahu, despite the current economic downturn.